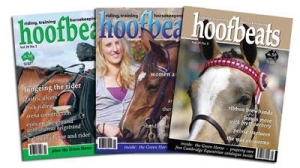 Many of these earlier issues of Hoofbeats Magazine are still available in the original printed version. Choose the issue(s) you wish to purchase from the website listing and enter the Months & Year and Vol & No (eg; Aug/Sep 2000 Vol 22 No 2) in the field next to the quantity field in your shopping cart. Separate multiple issues with a semi-colon;. Make sure you adjust the 'Quantity' field to show the number of issues you wish to purchase. Postage for Printed Magazines within Australia is $5.00AUD per issue: NZ, Asia, Pacific is $5.80AUD per issue: UK, USA, Europe and Other Regions is $9.80AUD per issue. Countries included in the NZ, Asia and Pacific postal zone are Brunei Darussalam, China, Christmas Island, Cook Island, Fiji, Hong Kong, India, Indonesia, Japan, Malyasia, Maldives, Marshall Islands, Nauru, New Zealand, Norfolk Island, Paupa New Guinea, Philippines, Pitcairn, Singapore, Thailand.